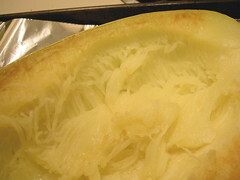 We harvested the Spaghetti Squash which my husband planted. 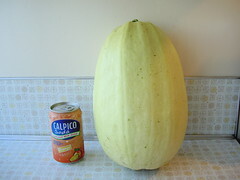 My mother told me that it’s called Ito-kabocha (thread pumpkin) in Japanese. I compared it with a can of Calpico. By the way, Calpico is a Japanese milky juice and it’s originally called Calpis in Japan but Calpis sounds like Cow piss so they changed the name. I baked in the oven for 30 minutes with 350 degrees F (175 degrees C). 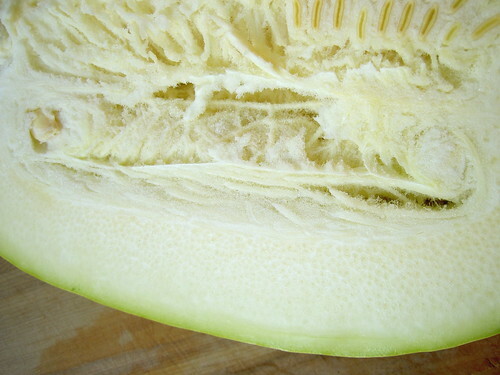 I scooped the squash out and it was really like spaghetti. So I made Spaghetti Bolognese. When my husband looked at this he was doubting the taste but when he tasted it he said it was delicious. 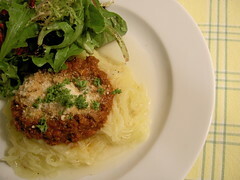 I heard vinegarated spaghetti squash is good too. It’s low calorie and great for dieting.